A meeting with Jeremy Corbyn to discuss anti-Semitism in the Labour Party was a "disappointing, missed opportunity", Jewish leaders have said. 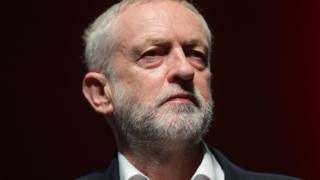 The Jewish Leadership Council and Board of Deputies of British Jews said the Labour leader did not agree to any of the concrete actions they asked for. They want disciplinary cases speeded up and Mr Corbyn to use his "personal authority" to drive cultural change. "I am absolutely committed to rooting out anti-Semitism," Mr Corbyn said. The party has been dogged by a series of incidents including criticism last month over Mr Corbyn's comments on an allegedly anti-Semitic mural in 2012 and the Labour Party suspension of former London Mayor Ken Livingstone over his claim that Adolf Hitler had supported Zionism in the 1930s. The Labour leader had been accused of not taking the issue seriously enough by Jewish groups and some of his own MPs, who took part in a protest in Parliament Square last month. And on Thursday last week, MPs shared their own experiences of anti-Semitic threats in the House of Commons. The Jewish Leadership Council and Board of Deputies had written to Mr Corbyn following last month's demonstration to suggest "areas of action". After a meeting with Mr Corbyn, which lasted more than two hours, the organisations said in a statement: "We are disappointed that Mr Corbyn's proposals fell short of the minimum level of action which our letter suggested. "Words in letters and newspaper articles will never be enough. We welcome the fact that Mr Corbyn's words have changed but it is action by which the Jewish community will judge him and the Labour Party." The Jewish leaders also say the Labour leader has been slow to act on the recommendations of a 2016 report by Labour peer Shami Chakrabarti, which called for action to address what it said was the "occasionally toxic atmosphere" in the party, but it has yet to be implemented in full. Accusations that anti-Semitism wasn't being taken seriously enough by Labour are proving politically toxic in two ways. First, they undermine Labour's "brand" - a party that stands for equal rights and anti-racism. And secondly, the effort to detoxify the issue has arguably diverted the party's leadership from the forthcoming local election contests. So it would have been helpful if the Jewish groups had suggested that progress had been made since their demonstration in Parliament Square, which some of Jeremy Corbyn's own MPs joined a month ago. Perhaps the most positive interpretation is that there was a disagreement over detail and not a fundamental division in outlook. That's certainly how sources close to the Labour leadership would like it to be seen. Mr Corbyn said it was a "positive and constructive" meeting and shadow communities secretary Andrew Gwynne said it was "full, thorough and frank". "I am absolutely committed to rooting out anti-Semitism from our party and our society," Mr Corbyn said. "When members of Jewish communities express genuine anxieties, we must recognise them as we would those of any other community. "I have charged our new general secretary Jennie Formby with improving our disciplinary procedures as her top priority to ensure all complaints are dealt with swiftly and fairly." He said further steps would be laid out in the coming weeks. Responding to the statement from Jewish leaders, which said none of their action points were agreed to, Mr Gwynne said: "That's not my understanding of what was agreed. "Whilst there was a number of issues raised, actually many of those issues we agreed to either implement or we were already implementing or we agreed to do something in more detail... I'm not sure how they've interpreted the meeting." He said they made it "very clear" that nobody should share a platform with any member found guilty of anti-Semitism, or someone who had been suspended. And the "vast majority" of cases involving anti-Semitism allegations will be dealt with by July, he added. In an article for the Evening Standard published ahead of the meeting, Mr Corbyn said Labour was taking action, with more than 20 members suspended in the past fortnight, adding: "But we have not done enough to get to grips with the problem, and the Jewish community and our Jewish members deserve an apology. "My party and I are sorry for the hurt and distress caused." A separate round table event organised by Mr Corbyn on Wednesday has been postponed. Jewish groups had said they would boycott it amid concerns about the inclusion of the pro-Corbyn group Jewish Voice for Labour. The organisation has accused opponents of using the anti-Semitism claims to damage the Labour leader.